The EAR 4000 is one of ITS's "top of the line" automated attendants, developed to help improve your customer relations, by providing outstanding service, as your business grows. Offering your customers a friendly greeting, the EAR 4000 answers calls 24 hours a day, 7 days a week, enabling customers to reach their required destination swiftly and efficiently. Affordability is predominantly important where small businesses are concerned and therefore the EAR 4000 was designed with cost effectiveness in mind. 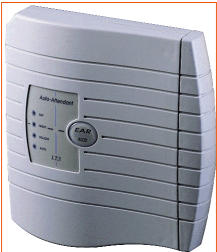 The EAR 4000 comes in a 2 or 4 ports version with up to 1 hour of answering machine storage time. Incorporating the EAR 4000 in your front office provides back up to the receptionist and no matter how many calls come in at once, the auto attendant handles them efficiently and provides complete, after hour service. Opportunities aren't missed with the EAR 4000 allowing employees to be reserved for responsibilities that involve personal interaction with customers. Opening Greetings for different Operating Modes : Day, Night, Holiday, Break. Up to 1 hour of Recording Storage time. PC programming (Using EUP), Touch-Tone Phone (Local/Remote). Integration with existing PBX : In-Band DTNF Integration. With its exceptional functions, the tiptel 215 clip is ideally suited for personal use. 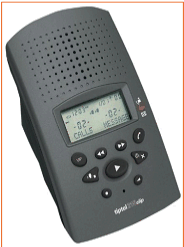 The tiptel 215 clip stores announcements up to two minutes long and provides a recording time of up to 30 minutes for incoming messages. You can even screen messages while they are being recorded and pick up at any time while the person is talking. is already going through. The phone numbers of important callers can be allocated a VIP status. When a call from a VIP phone number is transmitted to the tiptel 215 clip, it provides a special ring tone indicating, for example, that it's a friend or family member calling. To access your machine remotely, simply set up a three-digit personal code. Extensive options - such as the announcement of callers' phone numbers when you were unable to pick up the phone - make the tiptel 215 clip a versatile mailbox with functions that you can access and use remotely. Digital answering machine with up to 30 minutes of recording time. Two separate announcements of up to 2 minutes each (one announcement with incoming message recording, one without). VIP function that signals incoming calls from important callers with a special tone. Call list of the last 69 phone numbers and VIP call list of the last 24 phone numbers. Direct callback to callers from the call lists and also while messages are playing. Large LCD display and voice prompts for optimal operability. Dimensions (W x H x D): 94 x 80 x 130 mm. Weight: 235g (plus batteries and power supply unit). Power consumption: Approx. 3W (while idle). CLIP function: Dual mode DTMF/FSK. 30 minutes incoming message (ICM) recording time. Maximum message length of 2 minutes per recording. one without, each up to 2 minutes. Automatic activation of "Announcement Only" when the maximum recording time has been reached. Day and time stamp with each recorded ICM Optional playback of all or just new ICMs. Skip and repeat ICMs ("skip function"). Delete individual or all messages. Call screening while ICM is being recorded. Call pickup possible even while answering machine automatically answers. Answering machine pickup adjustable from 2 to 8 rings. Memo function for recording information directly on the machine (maximum 2 minutes recording time per memo). Batteries included for data backup during a power failure (4 x 1.5 V AAA).